My vacation is drawing to a close and the last item on my list is tomorrow's Marcie Mazzola Memorial Foundation 5K. It will be the my first race since February's Snowflake 4 miler. Given the extremely mild winter, it might have been nice to run a race in March. 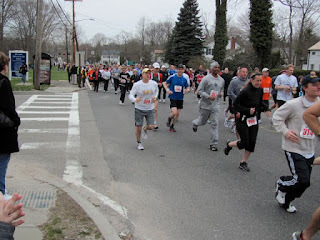 On the other hand, I've been able to use the time to train for the upcoming LI Half Marathon. Prior to this week, most of the runs I've been doing have been more LSD than PDQ. The surprising result has been that long slow running has provided enhanced stamina that is helping my speed. After months of morning runs where breaking a 9:00 pace was a rarity, I've done it three times in the past week. How will this affect my performance at tomorrow's race? I'm hoping that some hard running this week, followed by two days rest, will translate into a good run. The Marcie Mazzola 5K is a nice race and this will be the fourth time I run it (my first year the distance was 4 miles). The community feel, and the fact that it was my first race, makes it a sentimental favorite with Team Emerging Runner. Hopefully the rain will have moved out by the 8:30 AM start and we'll have clear conditions for the race. Not much to do at this point but think about my strategy, gear, nutrition, hydration and shoes. All good distractions. Race report tomorrow.